Robert’s note: We don’t typically discuss trading, because for many of our readers, a long term, ETF-based investment strategy makes sense. However, trading stocks is a path to wealth, and many people have been successful at it (we’ve spoken to Timothy Sykes before). But today’s guest post is great, because it’s thorough, and it acknowledges that trading isn’t right for everybody. And if you’re thinking about it, you need to do it the right way, with education and practice. I don’t necessarily agree with everything, but I do appreciate that the team at LiveTraders.com put in a lot of time and effort to pull back the curtain and really explain what trading is all about. Day Trading. Most people have heard that term before, and it is usually followed with some form of negative comment or reaction. So, what is day trading and is it as bad as people say it is? After trading the markets for over 11 years, I thought I’d set the record straight and not only dispel some of the negative information out there, but also help folks to better understand exactly what day trading is and how they can get started if they so choose. My hope is that this article will get people to think more rationally about this very serious business rather than simply listening to erroneous commentary from TV or internet pundits, which leads to a great deal of misinformation. Before we get started, please understand that any form of trading or investing can be risky and it’s possible to lose money. The comments made in this article are only my personal opinions and not meant to be construed as financial advice. The term ‘Day Trading’ is very broad, and can also be referred to as ‘intra-day trading,’ ‘scalp trading,’ or ‘micro trading.’ Though slightly different in their approach, all of these terms are used to describe someone who enters and exits trades relatively quickly. This typically means ‘minutes’ or ‘hours’ rather than days, weeks or even years, which is what the ‘average’ investor is typically used to. There are longer forms of ‘trading’ such as ‘Swing Trading’ or ‘Core Trading.’ The only difference is the timeline. Day traders are in and out many times a day, whereas a Swing or Core trader will hold their positions for much longer periods of time, sometimes even years, similar to the average fundamental based long term investor. Most day traders use a process called ‘technical analysis’ to choose the stocks they are looking to buy, whereas the average investor primarily uses fundamental analysis, which we’ll talk about in a bit. There is a lot of talk that day trading is no different than gambling. Nothing could be farther from the truth. In actuality, ‘proper investing’ is more akin to gambling than trading is. Let me explain. Technical analysis trading is based on the use of specific chart patterns tested over long periods of time that increase our probabilities of making money, and to make these probabilities work in our favor we must be CONSISTENT with our approach. The reason trading gets a bad name and is often likened to gambling is because many so called traders are NOT consistent in their approach. They take random trades, with random levels of risk and have no real edge. A professional trader always has specific patterns they trade with very detailed risk and money management which leads to a positive expectance, which leads to making money consistently. This is how we gain our edge over the market. In fact, average investors are far more likely to ‘gamble’ than traders are because they have no real parameters for their investment decisions. They simply buy, hold, and hope! Professional traders do not buy, hold and hope. They have very specific and clear parameters for EVERY trade they take. A good trader will NEVER take a trade that doesn’t have a pre-determined ENTRY PRICE, PROTECTIVE STOP LOSS and TARGET. This means that the potential outcomes of the trade are already known BEFORE the trade is ever taken. How many investors genuinely know what their exit strategy is BEFORE they enter the investment? Virtually none. The reason this is such an issue is because they are basing their decisions purely on emotion. Sure, they might be using some form of fundamental analysis to decide if it’s a ‘good’ company; perhaps credit risk, company sales, P/E ratio, management team and overall growth, however, stocks do not always trade rationally. Where does this leave the fundamental, long term investor? They typically don’t know themselves! I’ve spent time at a large bank on a Wall Street Institutional trading desk, and have had many conversations over the years with investment bankers, hedge fund managers and wealth managers; the one thing that stays consistent across the board is their LACK of an exit strategy. What can we learn from this conversation with John? For me this conversation was not surprising at all, because the general consensus is that the markets can’t be beat and we should buy and hold forever, especially if it’s a large, ‘solid’ company with good fundamentals. Obviously that’s a slight exaggeration but this thought process is extremely common. ‘Buy and Hold’ is the way to go. The problem with this approach is that people don’t know what to do WHEN (not if) something bad happens. Anyone remember the financial crisis back in 2008? The markets were crashing, losing more than 50% at one point, and while people were cursing the ‘crooks’ on Wall Street, they were dumping their portfolios for huge losses and vowing to never again invest in the markets. The markets bottomed out in March of 2009 and have been higher for 8 consecutive years now. This is what happens when you let EMOTION rule your investments or your trades. The reason it is such a huge problem is that the average investor has no plan. Buy, hold and hope. This is a very difficult way to approach the stock market. I think the chart above clearly reflects that having no STOP LOSS or EXIT STRATEGY is a very BAD IDEA. This is why traders are often times far more prepared for negative situations than average investors. So, when we look at the main difference between investors and traders, the one thing that continually arises is the lack of a plan for long term investors, whereas every professional trader has a trading plan. It’s the ONLY way to make money in this business. 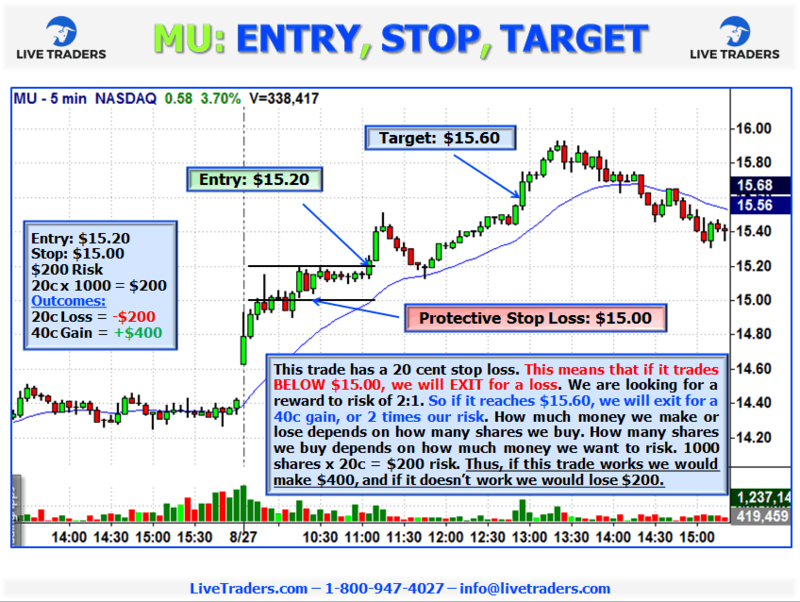 A good trader knows his entry, protective stop loss and target BEFORE he enters any trade. Thus, why are traders referred to as gamblers, and investors considered to be smarter? It’s a simple lack of understanding about the trading business. That’s it. Let’s take a look at the chart below to get a better idea of how a trader would prepare for a trade. Note: There isn’t the time or space in this article to get into specific patterns. We’ll save that for next time! This chart is simply to show the process a trader would go through. Although there are actually 2 technical patterns on this chart, we’ll focus on the ‘Breakout’ play that triggers at $15.20. As you can see from the chart, everything has been predetermined BEFORE the trade was taken. The entry is clearly $15.20, the stop loss (if we’re wrong) is $15.00 and we’ve decided on a 2:1 reward to risk ratio, so the target is $15.60. Only 2 things can happen. It will either pay us $400 if we’re right or we’ll lose $200 if we’re wrong. Thus, how often do I need to be right to make money? Less than 50% of the time. There can be some subjectivity with regard to target areas, however, for me personally I always use 2:1 as my target. Through the years I’ve found it to be a very good balance in most market environments. The topic of ‘targets’ is a whole different discussion, one we don’t have time for today, but certainly of great importance. With regard to choosing targets, the most important part is that you are CONSISTENT. I always shoot for 2:1, and never deviate from that. If you stay consistent, the odds will work in your favor. This doesn’t mean that you have to shoot for 2:1 targets, and it also doesn’t mean that you can’t have different levels of reward to risk sometimes, based on certain charts and market environments. However, for most traders, especially newer ones, shooting for 2:1 targets is generally the way to go. If we don’t hit target, then we will stop out. It’s very straight forward and simple, unlike a long-term investor trying to figure out his or her target and stop location. To be very clear, the horror stories you hear about day trading have NOTHING to do with the technical chart patterns, or that trading doesn’t work, they are almost entirely down to lack of emotional discipline by not following their trading plan. This usually means (but is not limited to); not taking stop losses, risking too much money too soon, cost averaging down on LOSING positions, and not stopping when your trading plan/money management says to quit for the day. Traders have very specific rules written in their trading plan. For example, one of the key components to my trading plan is that I am not allowed to lose more than 3 trades on any given day. This means that if I am risking $300 per trade, and I lose $900 throughout the course of the day, I must stop immediately. If I don’t stop then I am breaking the rules of my plan and endangering the favorable odds of my positive expectancy. This would be a poor example of money management, brought on by a lack of emotional discipline, which sadly is all too common in the trading world. If you are risking $200 on a trade, and you are -$200, then you need to exit the position. However, if you let it go to -$500 or more, then you are breaking the rules of your plan. This is when trading becomes gambling. The rules we have in our trading plan are put there for the well-being of the trader. They are non-negotiable. If you have an office job and you decide not to show up for 5 days in a row without telling your boss, there is a good chance you’ll be fired. Why? Because you didn’t fulfill the duties of the job. Trading is no different. If you don’t follow the rules of your trading plan, you will be fired. How? The market will take your money and your account will dwindle down to nothing and you will be forced to quit, aka: fired. Any negative comment you hear about trading or likening trading to gambling is almost always related to the trader having a lack of discipline, which has nothing to do with the patterns working or not working. It’s no different than someone who dumped their entire 401k in February 2009 at the bottom of the market (after a 40% drop) then watched the market go higher for 8 straight years, and then blames it on ‘the crooks on Wall Street.’ That is simply a lack of understanding of the markets, or in our case, trading. Don’t have proper money management and quit when their plan suggests they should. The reason that traders struggle with discipline is because they’ve never had to manage themselves before. They’ve always had bosses to tell them what to do and when to do it. Even people who have owned businesses before will often struggle in the beginning of their trading career because they are not held accountable to anyone but themselves. In business your customers and clients let you know if you’re doing a good job. They let you know through their wallets. In trading, you are sitting alone in a room, with none one there to keep you ‘honest’ and the money sometimes doesn’t feel real because it’s just an electronic number at the bottom of the screen. The worst thing a trader can do is lie to themselves, which is a common practice. What you don’t want to do is risk too much money too soon before you have any idea of what you are doing. Don’t let your expectations exceed your experience level, which is a recipe for disaster, and yet too many aspiring traders fall into this trap, largely due to ego or prior success in a different field. Don’t let this happen to you! 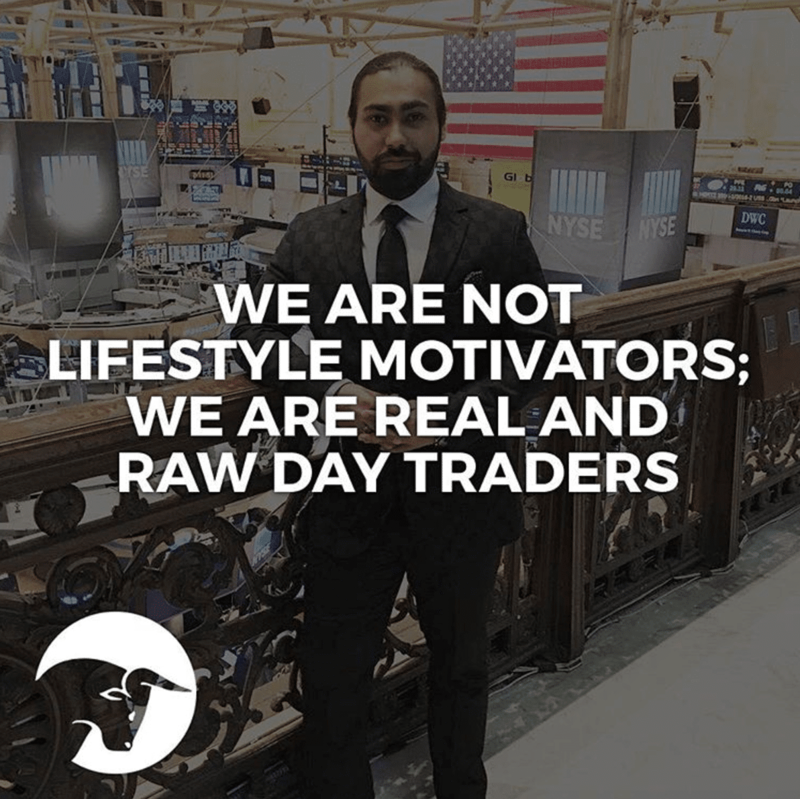 Day trading is not some get rich quick scheme or an erratic form of gambling, it is a proper business that takes times, effort, discipline and patience to learn, just like most other professions. What many people don’t realize is that big banks also ‘day trade,’ yet no one is calling them gamblers. 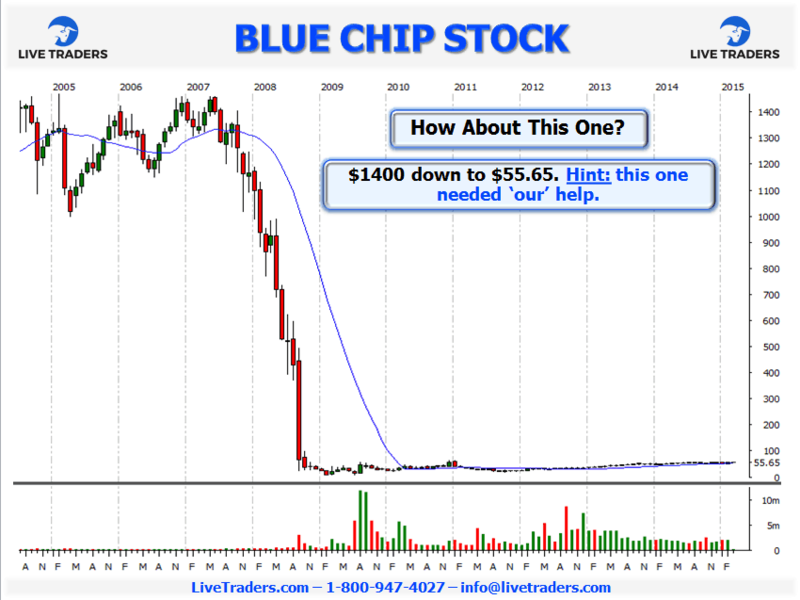 Blue Chips are large companies with solid reputations. Financially fit, with dependable earnings and even dividends. 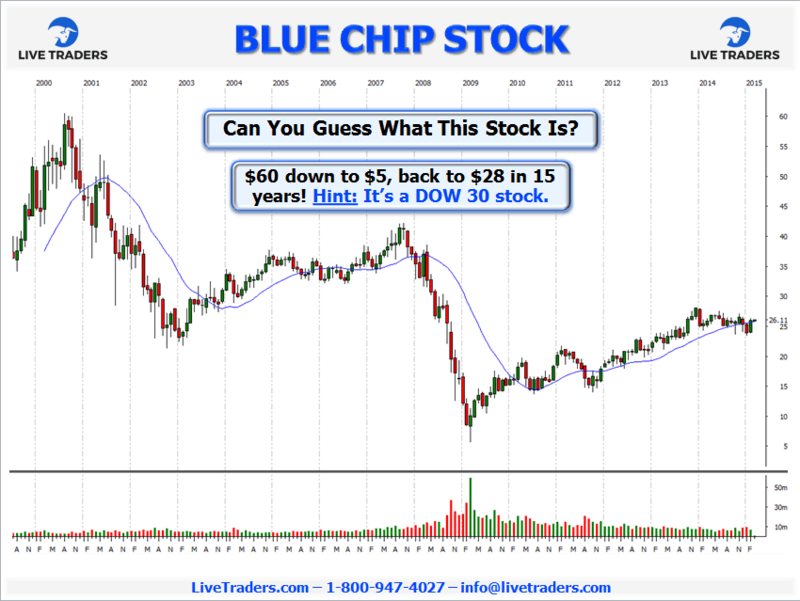 Let’s take a look at a few ‘Blue Chip’ stocks using the buy and hold methodology. These are considered to be ‘good,’ ‘solid’ investments for long term holds. You know, the kinds of stocks that can weather any storm. The kind of companies that you couldn’t possibly go wrong if you owned them. They are intertwined into the very fabric of the American culture, managed by some of the brightest minds in the industry. Disney, Walmart, Visa, Intel etc. Let’s take a look at a few. Did you get it? This is Citibank (C). Founded in 1812 and a market cap of roughly $162 billion dollars. 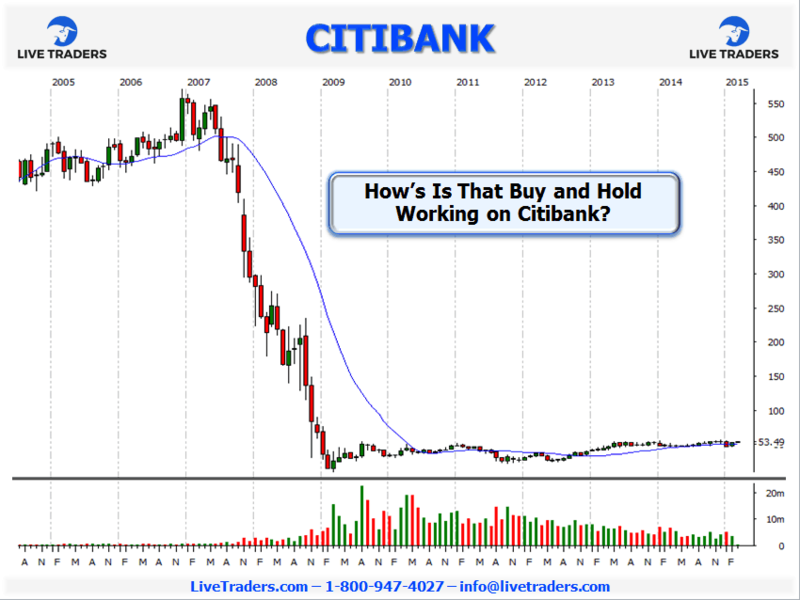 Citibank happens to be one of the largest banks in the world, ‘too big to fail,’ but not too big to be a horrible long term investment. This stock used to be at $550, now it’s barely a $50 stock! How is that long term investment working out? Let’s look at one more for good measure. This is American International Group, better known as AIG. Founded in 1919 and has a market cap of roughly $76 billion dollars. This investment has gone from over $1400 to $55 in a 10 year period. How long do you think it’ll be before it gets back to $1400? Who knows, but it’ll likely take a very very long time. Let us NOT forget about Bear Sterns, ENRON, and Worldcom/MCI. They were all ‘great’ blue chip type companies with outstanding fundamentals, where are they now? 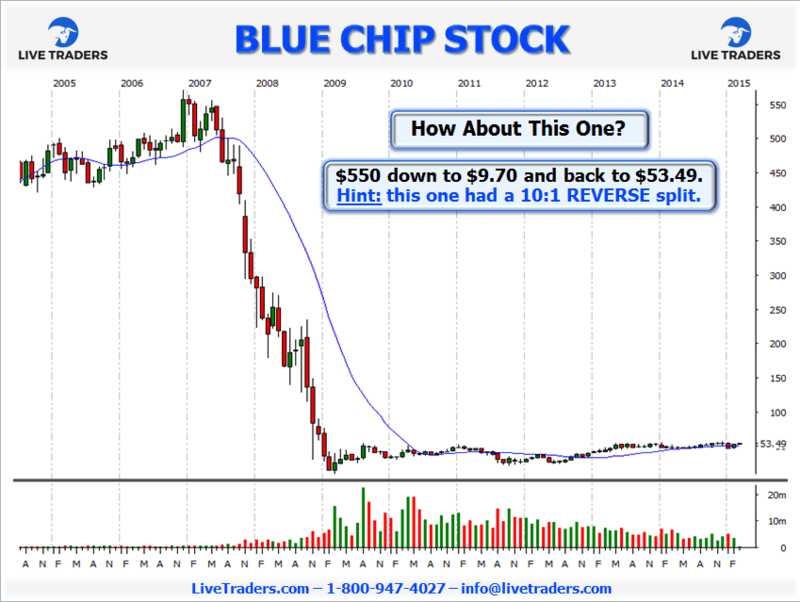 The point here is not to ‘trash’ on traditional fundamental investing or blue chip stocks, but rather to show that no form of investing, including trading, is perfect. I would venture to guess than FAR more money was lost in bad GE, C, AIG, Bear Stearns, ENRON and WorldCom investments than has ever been lost in the day trading realm, yet one method is lauded as ‘the best approach’ and the other method is scoffed at as being pure gambling, yet NOTHING could be further than the truth. 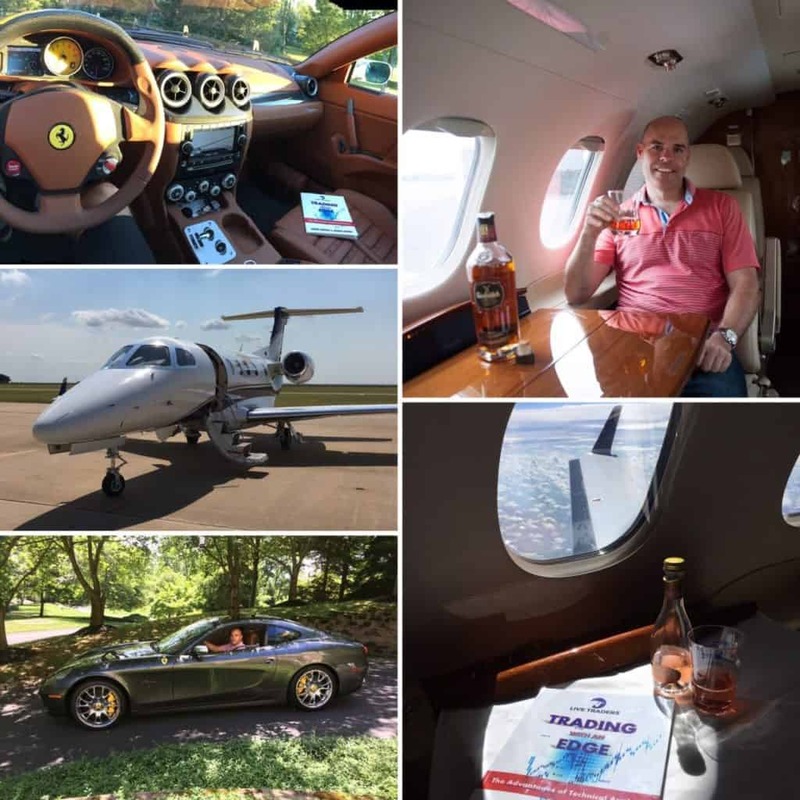 Day trading is a legitimate, viable business that thousands of people earn a living at each and every day. Don’t let the mass media or internet have you think otherwise. As with anything, good trading is about hard work and discipline. There are various ways you can get started in trading, however the worst thing you can do is to randomly open up a brokerage account with a lot of money and then start pushing buttons. This is a serious business for serious people. Just like anything else, you need to do your research and homework on where to ‘hang your hat.’ Obviously getting an education is crucial. Can you think of any job you’ve ever had (outside of ditch digging) that didn’t require a specific level of education and/or training? Most companies require a college degree these days, and if they don’t they certainly require a high school degree. Despite having either or both of those educational diplomas, almost every position in the world requires some level of on the job training. Why? Because you don’t know what you don’t know, and in most companies there are specific ways of doing things because they are proven successful! Trading is no different. If you want to be a consistently profitable trader, you will need education, training, and of course real market experience. Here are a few ways you can get started. Research online for trading books, check out many of the free ebooks on offer. Livetraders.com offers a 70 page FREE ebook that is extremely detailed and informative about trading basics. 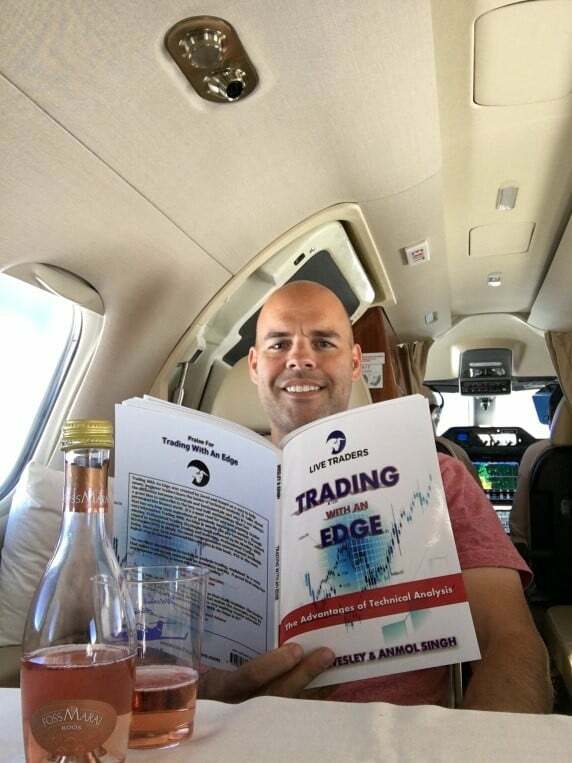 Remember, reading a book will not grant you trading mastery, it simply fills your head with important information. Once you have acquired this valuable, yet basic information, you then have to make a decision if this is worth pursuing, which is something only YOU can decide. If you choose to take the next step, then you need to decide what type of account is best for you. 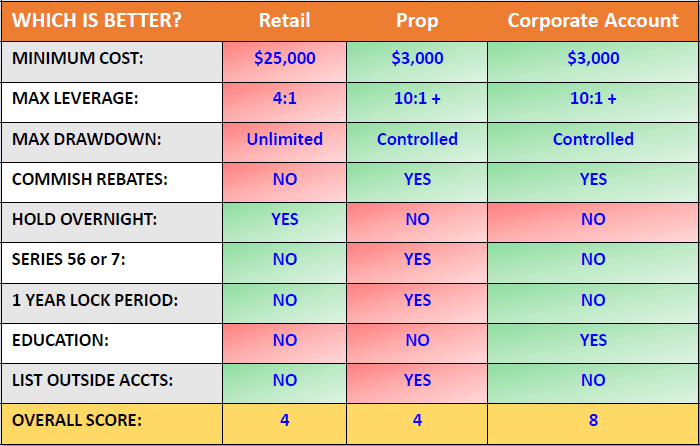 Retail, Prop or CAP. These choices can sometimes be confusing, so I broke them down into simple descriptions below. These are the ones you see on TV: ETRADE, TD Ameritrade, and more. There is nothing inherently wrong with them, except that they usually require a minimum of $30,000 to intra-day trade, usually charge more for trading commissions and they don’t offer very good leverage, typically 4:1 intra-day and 2:1 overnight. As mentioned above in order to take an ‘unlimited’ number of trades you have to have at least $25,000 in an account, usually more, because if you go below $25,000 you can no longer take unlimited trades. This is called the “Pattern Day Trading Rule or PDT” and it is a government mandate, not an individual company thing. These types of ‘retail’ accounts usually allow 4:1 leverage intra-day and 2:1 leverage overnight. Despite these stipulations, there are many ways to get around this rule, and start day trading with much less money. They include, but are not limited to Prop Accounts and Corporate Accounts. Prop accounts will allow you to trade with as little as $3,000, and typically offer 10:1 and even 20:1 leverage which is good, however, in order to get these benefits you have to pass a series 56 test, provide access to all of your outside investment accounts and they lock your initial deposit for 1 year. The chart below does a good job of showing the differences between each account. Trading fees and costs can really add up, so it is important to make sure you have a clear understanding of what each company/brokerage charges for monthly platform fees as well as individual trading commissions. Most companies are only concerned with how much you can generate in commissions for them, thus they don’t offer educational packages and their customer support is sometimes lacking. It’s usually best to talk to experienced traders and get their opinion on which platform is right for you. Now that you have a better understanding of the difference trading accounts out there, it’s time to choose one. Much of this depends on how well capitalized you are, how much discipline you have and of course how important controlling trading commissions is. HOWEVER, opening any of these accounts does not give you the right to go and risk lots of money when you are new! The single biggest mistake that new traders make is risking too much money too soon. They somehow feel entitled to profits. Here’s some advice, you ‘earn the right to raise your risk.’ Thus, when you open up your trading account, start slow and start VERY SMALL. Let’s say you open up a trading account with $30,000, which is the minimum required for a ‘retail pattern day trading account,’ you should be risking no more than $25 per trade. This means, if you lose or make a mistake you’ll only be out $25 or slightly more if you mess up. In the beginning your goal should not be to make money. Your goal should be to learn how to trade. In fact, for the first 2-3 weeks you should be using a simulator so you can learn the ins and outs of your platform. Then slowly transition to real money, in very small increments. I want to make this extremely clear: I don’t care if you are Bill Gates or anyone in between, you absolutely SHOULD NOT be risking more than $25 per trade when you start. If you so, you are simply throwing money away. Your first several months, even up to the one year mark, you will be learning so much new information, not only about the markets and technical trading, but also about your own emotional demons. This is a time for learning and introspection. Too often new traders have too short of a time line, they get frustrated and then do something stupid, like go on tilt and blow up their account. These are the horror stories you hear. This article is meant to make you aware of these things to help you avoid these potential pitfalls. Once you learn the technicals and master your emotions (which can take a while) you will quickly realize that day trading is just a game of odds. If you follow your trading plan closely you will make money. It’s when you break the rules and do foolish things that bad stuff happens. Don’t let that be you. We’ve talked about the difference between fundamentals and technicals, as well as the reason why most traders fail. Let’s change things up and talk a little about why it’s such an incredible business. As previously mentioned there can be a substantial learning curve in trading, however, once you master the craft it is perhaps one of the best professions in the world. The freedom, time and flexibility it offers are second to none. 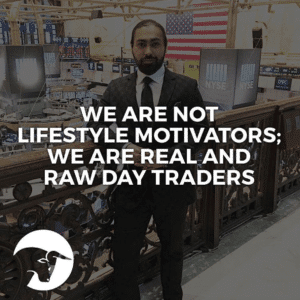 A good day trader can literally trade 1-2 hours a day and be completely finished. Personally I love to trade the market open, so I get to my desk at 9am EST to prepare, which usually entails creating my morning gap list and daily carry over list. This usually takes about 10-15 minutes, once finished with that, I then go through the list again and pick out my top 3-4 ideas, the ones that are most likely to move at the open due to a special gap or some other type of shock value. When the market opens at 9:30 I am ready to pounce. On most days I will be in a trade within the first 3 minutes of the day, and I’m usually completely finished trading by 10:30am EST. Some days I’m done by 9:45am EST, if I get a couple quick winners. I keep my trading simple, which is something we teach at Live Traders, so that the learning curve is significantly shorted. I focus on only 2 patterns, and I typically only take 2-3 trades per day. Occasionally 4 or 5, but most days I’ll only trade 2-3 trades and be finished within 1-2 hours. I’d say that’s a pretty good lifestyle. It certainly beats working for ‘the man’ from 9-5 everyday, being told when to show up and what to do. Trading also allows me to travel and work from just about anywhere in the world. In fact this past year I spent 3 weeks in Japan, 1 week in Florida, 1 week in the Bahamas, 1 week in California, 4 weeks in Pennsylvania, 2 weeks in New York City and a 2 weeks in Canada as well. That’s over 3 months away from home on MY own terms. Will your boss let you take 14 weeks off? Granted I worked and traded on many of those trips, but that was my choice, not someone else’s. These are just some of the incredible benefits that trading can offer. To further belabor the point, I don’t have to drive in rush hour traffic everyday, I get to see my kids go to school in the morning, and I can pick them up afterwards as well. When I worked on Wall Street in New York years ago, I left the house at 4:45am and didn’t come home until 7:30-8pm everyday, and sometimes on Saturday’s as well. I couldn’t imagine ever doing that again. The amount freedom, time and flexibility this career provides is something I’m simply not willing to give up. You cannot put a price on time, especially when it involved being able to spend that extra time with family and friends, it’s truly priceless. But hey, some people still prefer the daily grind of rush hour traffic and bosses telling them what to do. To each their own. I wouldn’t ‘trade’ my schedule for the world. Day trading using technical analysis is a serious business for dedicated professionals. Day trading is NOT gambling. It only becomes gambling when you don’t follow the rules and do foolish things, like cost averaging down on losing positions and risking too much money too soon. Day trading using technical charts is no different than using a fundamental approach to investing, but with a shorter time horizon and clearer parameters. When you begin your career, be sure to get an education. Don’t be cheap in this area or you will regret it later, because everyone pays. Whether you pay the market for experience or you pay for an education, you will pay regardless. Use a professional trading platform that has direct access and reasonable trade fees. Fusion, Sterling Lightspeed, Trade Station, Interactive Brokers etc are all good platforms. Start small, and DO NOT risk a lot of money in the beginning. This is the #1 mistake people make. You earn the right to raise your risk. The market doesn’t care about you. Trust your trading plan. It is there for a reason. It’s just a game of odds. Never trade with scared money. This means keep your day job or part-time job until you can replace it with trading. It will be much less stressful this way. The timelines to success varies greatly. It can be as little as several months and as long as 5-10 years. From my experience, it’s typically 1-3 years. 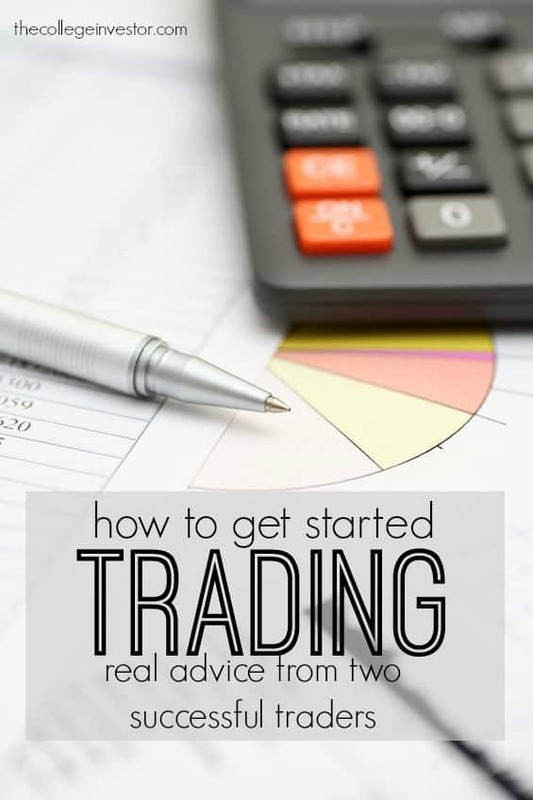 There is a lot of time and effort that goes into becoming a successful day trader, and you would be smart to do your homework before hanging your hat somewhere. It’s wise to talk to experienced traders about their journey and of course, do your own due diligence to get a better feel for where you would likely be most comfortable. I have been doing this for 11 years and I still learn something new everyday. The people who apply the knowledge and experience they acquire are usually the ones that are the most successful, so never get ahead of yourself and never let your ego trade for you, the market is all knowing and has a very uncanny way of teaching us lessons, especially when we least expect it. Trading is the truest meritocracy there is. The market doesn’t care how big your account is, what your experience level is, education level, intelligence level or anything else, that means it’s ‘generally’ fair for all participants (yes I know HFT’s and large banks don’t play by the same rules). There are no excuses in this business, it really only comes down to how badly you want to succeed, because there are no office politics or other issues to keep you from advancing, other than your own merit. On top of that, it provides as much or more freedom than just about any other career out there. Trading is a truly wonderful business. 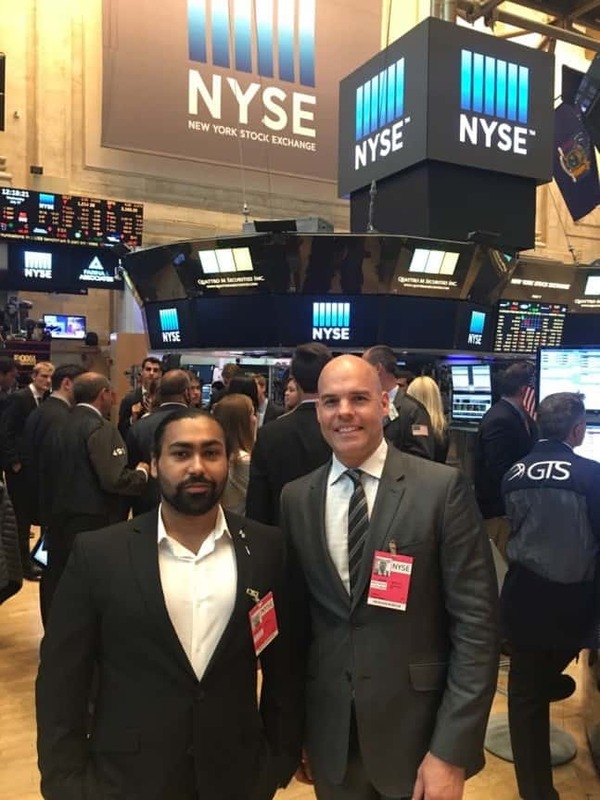 Best of luck in your journey as a trader, it is genuinely one of the most enjoyable and flexible careers out there, IF you are willing to put in the time and effort to master it. It won’t come easy, but it’ll be worth it! Written By Jared Wesley & Anmol Singh. You can learn more about them, and trading in general, at www.LiveTraders.com. Really cool article! I like the “inside scoop” and advice. Personally, I am looking to exit the 9-5 at some point and this would be amazing. I work in risk management (not financial risks) and am, by practice, very risk averse. How do I read up on the techniques and learn what stocks to choose?